Jimmy Fallon’s Tonight Show has a long, sporadic history of bringing on game-industry guests for promotional spots, even running a Video Games Week that showed off new consoles and games from 2010 to 2013. He’s geeked out for everything and everyone from the PlayStation 4 to acclaimed game designer Tim Schafer, but nothing got his little nerdy heart racing like a visit from Nintendo. 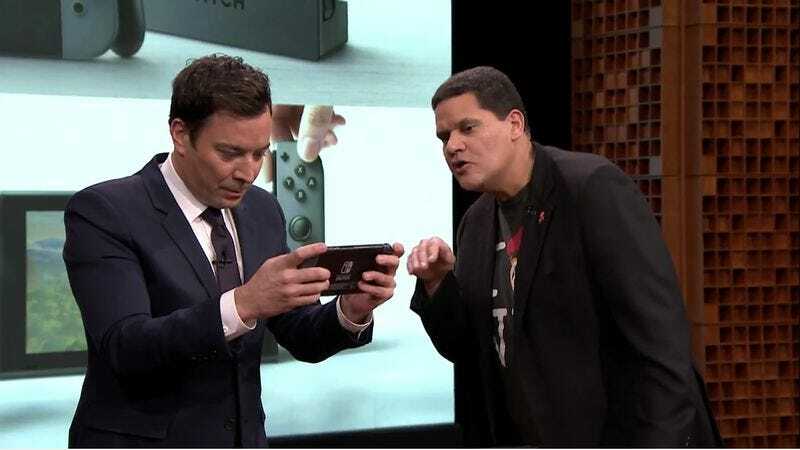 Last night, Fallon nearly exploded on air as Reggie Fils-Aime, president of Nintendo Of America, brought him a demo of the company’s upcoming mobile-game debut, Super Mario Run, which Jimmy played and screamed at, as he usually does whenever video games are on the show. But Fils-Aime had one more big “surprise” for Fallon and lifted up a suspiciously placed Question Mark Block to reveal the first-ever appearance of the Nintendo Switch, the new console that’s scheduled to be released next March. This was the first time we’ve seen someone actually playing the system, as Fils-Aime showed off a few minutes of The Legend Of Zelda: Breath Of The Wild before switching the console to handheld mode and handing the proceedings off to Fallon, who immediately freaked the hell out and excitedly showed off the tablet controller’s kickstand, one of its distinctly least exciting features. It’s not much of a preview, and it was obfuscated a bit by TV magic, but at least it was pretty endearing to hear Fallon rattle off the story of Shigeru Miyamoto’s inspiration for Zelda, only to realize no one cared about his nerdy rant and sheepishly shut down while even the developer himself pointed and laughed. More information about the Nintendo Switch—such as price, launch date, and games—will be coming on January 12.